You may have noticed something strange about Sunday's Emmy winners. It wasn't something they did. And it had nothing to do with Sean Spicer not being funny. It was something you probably didn't think too much about when watching in the past but became very noticeable once it changed. The 2017 Emmys got a new announcer, and it changed the flavor the show. Bringing a little extra energy was Jermaine Fowler from CBS's Superior Donuts. His energy level and, for many, recognizable voice made him a big part of the show. That was by design. "What most awards show do is have the announced locked in a closet reading form a script on cue," Jack Sussman, Entertainment EVP of music and live events at CBS, told Deadline before the Emmys. "What we will do is have Jermaine be an active part of the show. He will be connected with what's happened on the telecast and what happens next. What we want to do is get a peek behind the curtain in a fun, engaging way." The set-up allowed Fowler, a stand-up comedian, a little room to go off-script and also put him in front of the camera from time to time. Both of those are a rarity for awards show announcers. The reactions to Fowler's performance were mixed. Some praised the show for having an announcer with personality. Others had strong feelings about the volume of that personality, which wasn't out of left field. He was definitely not a subdued presence. No one will be talking about his "dulcet tones" in the morning. I wish @jermaineFOWLER narrated that GEOSTORM trailer. 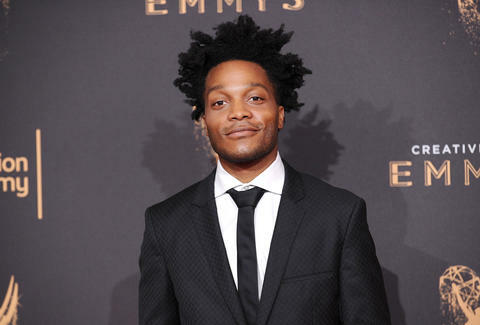 Oh wow I never cared about the #Emmys announcer ever until @jermaineFOWLER. At a minimum, everyone can agree he changed things up. That's not a bad thing. Awards shows can get painfully monotonous.